The South Mountains of central Arizona are a typical, but geologically simple, metamorphic core complex. The western half of the range is underlain by Precambrian metamorphic and granitic rocks, whereas the eastern half is primarily a composite middle Tertiary pluton. The Precambrian terrane is composed of two rock units, Estrella Gneiss and Komatke Granite, both of which were involved in a major episode of middle Proterozoic metamorphism and deformation that produced a steep crystalloblastic foliation. The composite Tertiary pluton has three semicontemporaneous phases: (1) South Mountains Granodiorite, the oldest and most widely distributed phase; (2) Telegraph pass Granite; and (3) Dobbins Alaskite. Both the precambrian terrane and the composite Tertiary pluton have been intruded by numerous, north-northwest-trending, middle Tertiary dikes. Well data tabulation for Eastern Mogollon Slope Region maps. 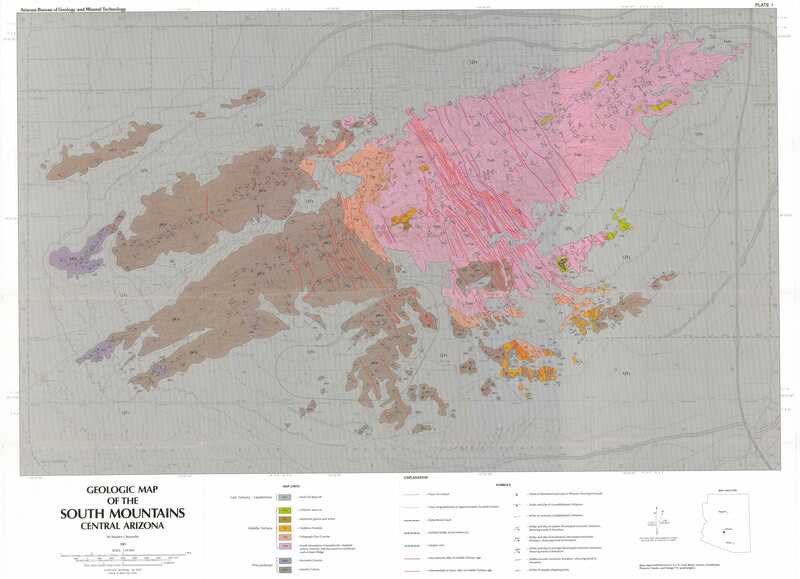 Arizona Oil and Gas Conservation Commission,1976 , Subsurface Structure Maps, Eastern Mogollon Slope Region, East-Central Arizona. Arizona Oil and Gas Conservation Commission OG-21, 18 p., 3 sheets, map scale 1:500,000.